“A City for Sale” – Sallust’s Histories – Everything is Oll Korrect! It has sometimes been said that a writer of history should be as phlegmatic and unimpassioned as the judge upon the bench. If the reader desires a dead history, in other words, a history devoid of the true spirit of history, the author assents to the remark. But if he desires a living, moving, breathing picture of events—a personam instead of a subjectam, the picture must not be undertaken by one who does not feel something of that which he writes. […] When all the higher and holier passions of the human heart are aroused in a struggle—when the barbarian is at your door with the torch of the incendiary in one hand, and the uplifted sword of diabolical revenge in the other,—feeling is an important element in the real drama that is passing before the eyes of the beholder. To attempt to describe such a drama with the cold words of philosophy, is simply ridiculous. If the acts be not described in words suited to portray their infamy, you have a lie instead of history. Nor does it follow that feeling necessarily overrides judgment. All passions blind us if we give free rein to them; but when they are held in check, they sharpen, instead of obscuring the intellect. Finally, ancient historians tell us what the ancients thought of themselves. If you’ve spent much time thinking about politics or culture, you’re likely well aware of the power of narrative, and how history is framed. When we read Herodotus, Xenophon, and the rest, we can see how our ancestors saw themselves in relation to other peoples, what they thought the significance of the events of their own history was, and of course their interpretations for the causes and effects of those events. All three of these aspects of ancient history tie together well in the work the writer I’ll focus on today, Sallust, a historian of the late Roman Republic. He completed two fairly short works, Catiline’s Conspiracy and The Jugurthine War, and left a third, the ambiguously titled Histories, unfinished at his death. Focusing on the first two, both provide us with the basics of how these events unfolded, Sallust’s opinions of the moral lessons to draw from them, and how he thought they demonstrated the state of Roman society in his own day and how it got to that condition. I won’t dwell on the first point for long, as summaries of the events Sallust describes can be easily found in encyclopaedias or other works about the Roman Republic. Catiline came from a prominent family, but one running on the fumes of past glories. 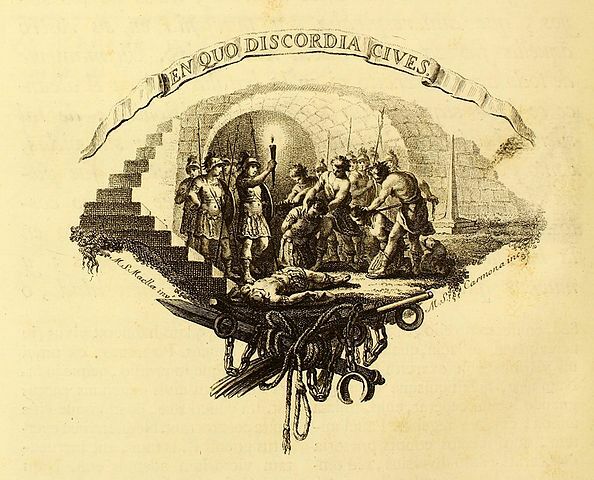 When his political career stalled, he attempted to organise a coup, but the plot was uncovered, several conspirators were put to death without trial by Cicero, who was consul at the time, and Catiline and his supporters were run down by the army and killed. The conspiracy’s significance came less from the actual coup attempt and more from the later fallout of the conspirators being executed without trial. Cicero justified his action by claiming that it was an emergency, but it would lead to his exile a few years after leaving office. Also, it was a stark example of the decay of the Republic, as Roman ambition turned from outside enemies, like Carthage, inward – but we’ll get to that shortly. The Jugurthine War was a Roman intervention into a civil war in Numidia. Again, the significance is less the war itself and more the problems with Rome itself that it put on display. Rome’s antagonist, Jugurtha, had a great deal of success in finding allies by bribing Roman officials, and when this tactic finally did fail he famously commented that Rome was “a city for sale, if only she can find a buyer.” Aside from the display of Roman avarice and lack of civic virtue, the war also boosted the careers and prestige of Marius and Sulla, the former already a major political force and the latter soon to join him as a giant, and controversial, figure in Roman history. Sallust keeps most of his editorialising to the prefaces of each work, but in both cases he spends much of his time speaking of glory, of honourable and dishonourable ways of gaining it, and how a virtuous man does not need to rely on fortune for worldly success. This second point becomes oddly confused, though, in his narratives. After describing the success of a risky decision by Marius, for instance, Sallust writes, “In this way Marius’ recklessness was amended by chance, and in place of blame he found glory.” Later, Sulla’s victory over Jugurtha largely came down to one of Jugurtha’s allies, Bocchus, deciding to betray him; this also looks a lot like chance, rather than a reward of Sulla’s virtue. Thematic coherence aside, though, his comments on virtue are of the kind that are always relevant and valuable. They also bring us to the third main point, and that’s how Sallust uses his account of recent history to explain and comment on the decadence of the late Republic. We can see, in Catiline’s ability to find co-conspirators and Jugurtha’s ease in handing out bribes, that Rome was consumed by factionalism, avarice, and ambition. How did this come about? To some extent, these had always existed. Earlier generations had seen multiple “Secessions of the Plebs,” avarice is a constant in human societies, especially in expanding empires, and if there’s one word to describe Rome at almost any point in its history “ambition” may well be it. Yet, things hadn’t been so bad before; during Sallust’s childhood Sulla had been the first Roman general to march on Rome, as an adult Sallust played a minor role as one of Julius Caesar’s supporters in the Civil War (of 49-45 BC), and a few years after Sallust’s death the Republic would finally collapse altogether. Sallust points to the victory over Carthage as the primary cause of Rome’s problems. Yes, Rome had been ambitious and avaricious, but in the past these impulses had been directed outward, against an external enemy, while the persistence of a real, existential threat in Carthage provided a source of unity to the various factions. After the Third Punic War, there was still conquering to do and external threats to face, but there was no new Hannibal anywhere on the horizon. Suddenly, the ambitious were more likely to seek gain at the expense of other citizens, and the factions had far less incentive to work together, as they no longer had a common enemy. [H]e was a noble of patrician descent, but from a family that was nearly reduced to oblivion because of his idle ancestors. He was educated alike in both Greek and Latin; he had enormous ambitions, craved pleasure, craved glory more. He spent his leisure time extravagantly, and yet was never distracted from business by pleasure, except for the fact that his attitude concerning his wife could have been more honourable. He was well spoken, clever and easygoing as a friend. He had an incredible depth of talent when it came to disguising his activities, but he was generous in many ways, especially with money. Before his victory in the civil war he was the most fortunate of all men, but his good fortune did not exceed his efforts. As for what he did afterwards [i.e., after the Jugurthine War], I do not know whether one should feel more shame or disgust in talking of it. Such commentary is invaluable for those seeking to understand Roman history from the Romans’ own point of view, and serves to bring the story of Rome from the realm of near-myth to a human level. Those looking for analogies to the modern world will find them in Sallust’s work, though those looking for solutions will come up short. Still, it can be comforting to know that these roads have been walked before, by men not so different from us. The Republic never would recover, but eventually Augustus would at least end the turmoil, and a great deal of glory still laid ahead for Rome. Perhaps we can hope for a similar outcome, if only we’re willing to work for it.